But Sarkozy succeeded as a politician. So what are the qualities which made him succeed? 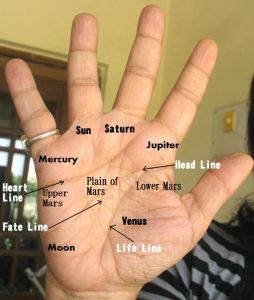 His hand has a broad palm with a well developed Moon and Venus mounts, shortish fingers which are slightly thick, a bent Jupiter (index) finger with a pronounced first phalange and two very square-tipped fingers, that of Apollo (ring) and Saturn (middle). Overall, the first phalanges are long. However, the headline is weak even if the other lines are well etched. His hand is on the larger side, and the thumb is average with a waisted second phalange and a strong will phalange. The Jupiter and Mars mounts are also developed. You can check out his hand photograph here and here. He has charisma no doubt, and a broad outlook on life. Communication abilities are good. So his hand shows that he is persuasive, diplomatic and charming. And he has a good heart, cares for people and is very idealistic too. But is this enough to make him a good politician? Well, he has leadership qualities to some extent but he is not a strong man. Leadership is a complex thing, but basically, it means that you can get other people to follow you, admire you, trust you. Sarlozy can manage that because besides the charming persona, he has integrity and ideals. He is shrewd too, and can be a little manipulative as well. He also has the ability to discreet and cautious. Sarkozy is also a doer. And no doubt, he is magnanimous towards others, like his colleagues. He is also ambitious, assertive and aggressive when he wants something and can stand up to his beliefs. His warm and affectionate nature means that he is genuinely fond of people and also the ladies. However, it is quite clear that his hand is not well balanced. He has the hand of a man with strong passions and imagination but willpower is average. Besides he can be impressionable and idealistic and this means that he will find it more difficult to keep himself in check than the average person. One can surmise why his two marriages failed. and may not be an easy person to live with. He can be pushy and aggressive and temperamental and moody. And controlling no doubt. His public persona is a good one. He is the kind of man who is at home in different milieus and can be comfortable with intellectuals as well as his drinking buddies. He is not a particularly independent thinker or analyst and tends to depend on others to give him advice. This in itself is not a bad quality, and in fact, can be considered a good one for a politician as long as he chooses his advisors with care. However, Sarkozy has a tendency (particularly at this age) to make decisions based on his feelings. He is creative and imaginative and can appreciate art and loves music. Although he has the appreciation of the fine things in life, he prefers the more useful (as opposed to arty) things. His hand shows musical talent, and it won’t be surprising to find out that he learnt a musical instrument sometime in his life. At times he can lack seriousness and focus, and this can make him a little playful. However, he has the ability to pull himself back. He likes his food and drink. Here is my take on a controversial video making the rounds of Youtube. It apparently shows President Obama and President Sarkozy staring at a Brazilian girl at the recently held G8 summit. From what I know of Barack Obama from reading his hands, he is very unlikely to do this. But Sarkozy is quite capable of it and he would see no harm in it either. At the UN Security Council recently Nicolas Sarkozy mocked Barack Obama, and well, this is not surprising at all because there cannot be two widely different people than these two. Obama is an intellectual but Sarkozy uses his heart more than his head. Update, 9th October: The latest news is that Barack Obama has won the Nobel Peace Prize for his attempt to bring peace to the middle east and also his nuclear non-proliferation efforts. Now Nicolas Sarkozy had mocked Obama on this exactly, saying that Obama was being impractical. Sarkozy will obviously disagree heartily with the peace prize being given to Obama. Related Reading: Does Barack Obama deserve the Nobel Peace Prize because of his ideals? or just check out the personality reading of Barack Obama, and other Heads of States from different parts of the world. Or read about the personality characteristics of other American politicians: Donald Trump, Mike Pence, Sarah Palin, Bernie Sanders, Mitt Romney or Arnold Schwarzenegger or the scientist Albert Einstein. 'Sarkozy is a pragmatic down-to earth type who uses his heart more than his head'. Isnt this a contradictory statement? A pragmatic person is one who is ruled by his head. Smita, human beings are complex, and this is brought out only too clearly in the hand. Qualities are present in different degrees say in amounts between 1 and 10, and a balanced person is when all these degrees are in balance. When contradictory qualities are present in a person, one side may operate more at certain times, but the overall effect depends on the strength of each quality. You can be pragmatic, but at the same time quite emotional. All pragmatic people are not ruled by the head, in fact I would say it is very unusual to find a person who is ruled by the head. Such people are calculating, and often cold and selfish. However in many pragmatic people neither the heart nor head rules. Sarkozy tends to use his heart more, but his heart does not rule. He is still a pragmatic person overall. Circumstances will dictate which of this qualities surface when. If he is shrewd he will know exactly when to be pragmatic and when to use his heart.